I get a lot of email. Most of the emails that I get from new pressure cooker users are asking for recipes. They get a pressure cooker, but don't know what to make with it. So I decided to do something about it. 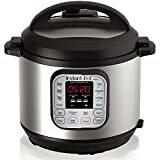 I have compiled a list of my top 100 pressure cooker recipes organized by Appetizers, Meals and Desserts (not in any particular order). Please take a look, try some out and let me know what you think.